Malaria parasites adapt their level of reproductive investment to suit their transmission environment. What does this mean for malaria control programmes? Exactly 16 years ago, we published a paper in Nature that predicted that malaria parasites from high transmission areas would evolve to have higher multiplication rates inside their hosts and thus be more likely to kill them. Actually, the prediction was that if we used vaccines that put a brake on multiplication, we'd end up with a more virulent parasite. Since our prediction was based on mice and maths, many found it hard to swallow. We needed to test it in the field. Since there was (and still is) no malaria vaccine in widespread use, we went to populations with different levels of 'natural vaccination' arising from ecologically driven variation in malaria transmission intensities. Since we couldn’t measure virulence directly (this would mean injecting lots of people with life-threatening parasites), we looked at the parasite's whole transcriptome and read this for signs of environment-specific adaptation. Like many organisms, malaria parasites have to choose how much effort they put into 'growth' (multiplying inside the host) and how much into reproduction (transmitting to new hosts). Inherent in the parasite's life cycle is a direct trade-off between these two life stages. This is because transmissible forms of the parasite are created directly from multiplying forms: when the latter converts to the former, future multiplication (and hence future reproduction) is sacrificed for current reproduction. What we found in this study is that transmission intensity-related adaptation appears to target this growth-reproduction nexus. We think that the parasite is using the reproductive switch to control multiplication rates in order to maximise total transmission output from an infection (fitness) given its environment-specific opportunities and constraints. When mosquitos are few, or immunity is not limiting multiplication, the parasite can afford to and will benefit from putting more into transmission. When mosquitoes are plentiful, or immunity is acting as a brake, the parasite will benefit more from investing in multiplication. The higher investment in multiplication over reproduction in high transmission environments found here is consistent with our earlier prediction back in 2001 that increased population levels of immunity would drive higher intrinsic parasite multiplication rates. We can't say for sure whether the adaptation we observed was immunity or other selection forces that relate to transmission intensity such as mosquito availability, numbers of concurrent malaria infections per host (i.e., in-host competition) or something else. 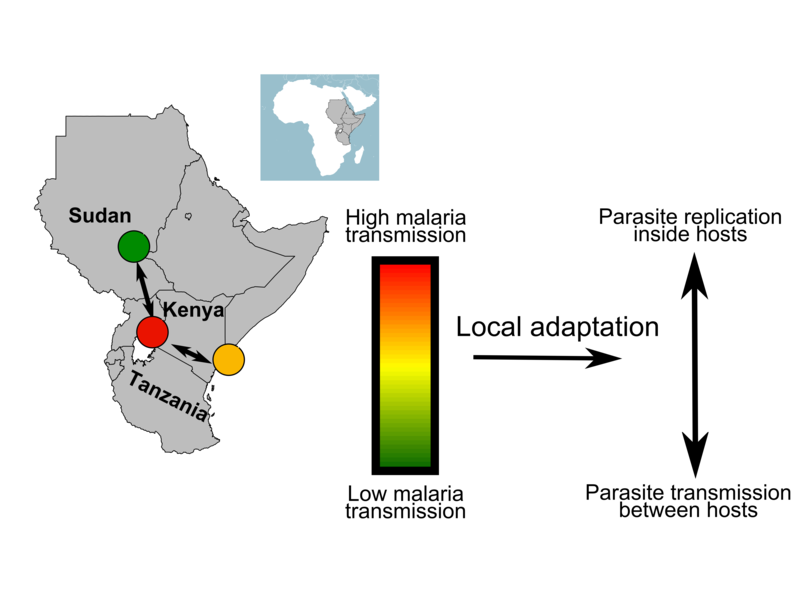 But the fact that the parasite populations from high vs. low transmission environments differed in a consistent way across three different transmission intensity settings tells us that the parasite does evolve to suit its local setting and therefore might change again when malaria control begins to bite. That the direction of adaptation was consistent with our prediction adds weight to our earlier conclusion that using malaria control strategies that target in-host multiplication (anti-replication vaccines, drugs) may force the parasite to become nastier while strategies that target transmission (bednets, infection- and transmission-blocking vaccines) are likely to do the opposite. We would not, and never have, argue(d) that drugs and vaccines should not be used: these save millions of young lives today and in the future. But there are many ways to ‘skin the malaria cat’. As for many now-conquered infectious diseases, we advocate a ‘prevention better than cure’ approach to malaria, not only for the usual epidemiological reasons, but for evolutionary ones too. Where in the world are species declining?